Porsche bolstered their reputation as ‘the car to beat’ at La Sarthe after locking out the top two positions in this weekend’s official pre-24 Hours of Le Mans test day. Held amid changeable conditions on the 8.47-mile Circuit des 24 Heures, Porsche’s 919 Hybrids topped both of the four-hour test sessions, the only chance to practice on the unique track ahead of next week’s 24 Hours of Le Mans. In the morning session, the no. 18 car of Romain Dumas, Neel Jani and Marc Lieb set the fastest time, with Jani lapping in a time of 3m21.945s before the drizzle that had drifted in by the session’s midway point became heavier, curtailing many teams’ running. The third Porsche 919 Hybrid of Nick Tandy, Nico Hülkenberg and Earl Bamber ended the test day second fastest. The track remained yet at the start of the afternoon’s action. However, conditions improved later on, with many cars bettering their times from the morning session. Among them was the no. 17 Porsche 919 Hybrid of Timo Bernhard, Mark Webber and Brendon Hartley, running in its evocative red Le Mans livery. In the hands of Hartley, the car set a best time of 3m20.061s, the best time of the entire test day. Just over 1.2 seconds behind them, the white no. 19 Porsche 919 Hybrid of Earl Bamber, Nico Hülkenberg and Total 911 columnist, Nick Tandy finished the day second fastest, while the no. 18’s time from the morning was good enough for fourth overall. 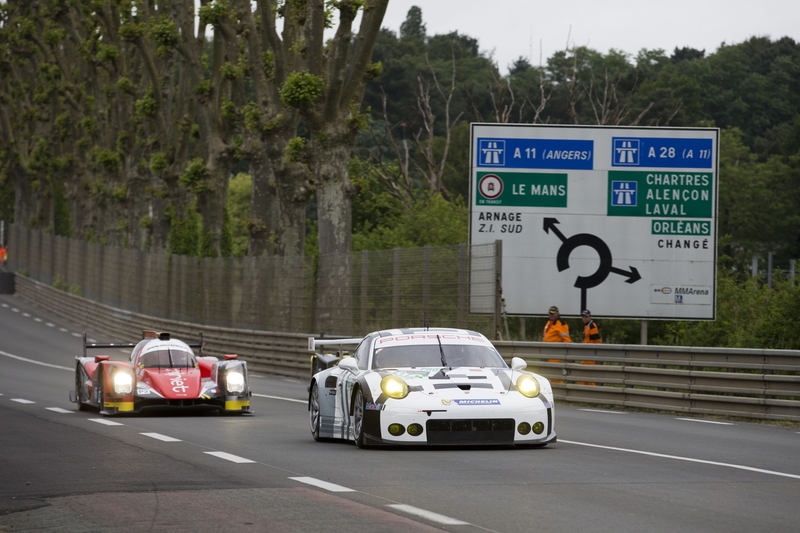 Patrick Pilet, Frédéric Makowieck and Wolf Henzler led Porsche’s charge in the GTE-Pro class, finishing fourth. In the GTE-Pro ranks, the two Porsche 911 RSRs of Porsche Team Manthey wound up fourth and sixth fastest, with the no. 92 car of Patrick Pilet, Frédéric Makowiecki and Wolf Henzler setting a time of 3m59.043s – 0.974 seconds behind the class-leading Aston Martin – during the morning’s running. The no. 91 Porsche 991 RSR of Richard Lietz, Michael Christensen and Jörg Bergmeister lapped in 4m00.272s in the afternoon session as Porsche Junior, Sven Müller also got time in both cars as he completed his mandatory ten laps as a Le Mans novice. The 23-year-old German is now eligible as Porsche’s reserve GT driver ahead of the 24 Hours of Le Mans, which kicks off next Wednesday with the first practice and qualifying sessions. For all the latest Porsche race and rally news, make sure you check out our dedicated motorsport section now. The no. 91 Porsche 911 RSR set the sixth fastest time in the hands of Richard Lietz.